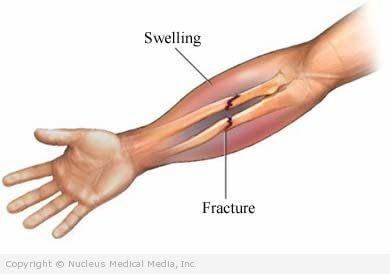 A forearm fracture is a break in one or both bones of the forearm. The doctor will ask about your symptoms, your physical activity, and how the injury occurred. The doctor will then examine the injured area. X-rays — a test that uses radiation to take a picture of structures inside the body, especially bones. It is used to look for a break in the forearm area. CT scan — a type of x-ray that uses computers to make pictures of structures inside the arm. It is used to look at the cartilage and tendons around the forearm. In complex fractures of both bones, it may be used to help reconstruct the bones. The doctor may prescribe pain medication depending on the level of pain. Your doctor will order more x-rays while the bone heals to ensure that the bones have not shifted position. When your doctor decides you are ready, start range-of-motion and strengthening exercises. Attention will be directed to the fingers and the shoulder so that you maintain motion in these critical joints. You will be referred to a physical therapist to assist you with these exercises. Do not return to sports until the fracture is healed and you have regained normal muscle strength and arm mobility. It takes about 8-10 weeks for a fractured forearm to heal. If the fracture has an open wound over it, the healing time will be longer. If you are diagnosed with a forearem fracture, follow your doctor’s instructions. Do not put yourself at risk for trauma to the arms. Eat a diet rich in calcium and vitamin D.
Build strong muscles to prevent falls and protect the forearm.